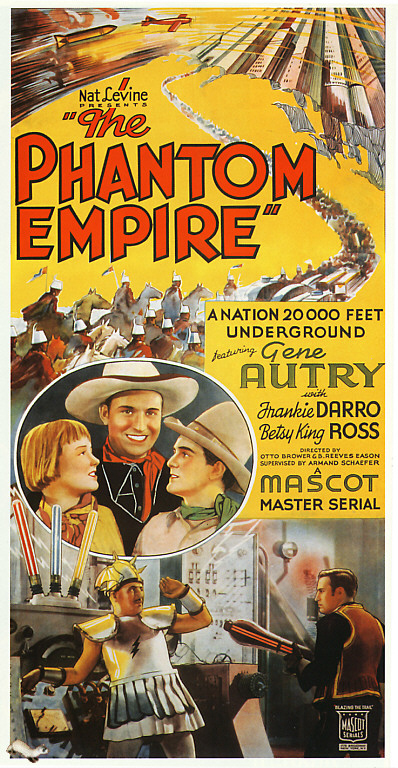 The Phantom Empire is a 1935 American Western serial film directed by Otto Brower and B. Reeves Eason and starring Gene Autry, Frankie Darro, and Betsy King Ross. This 12-chapter Mascot Pictures serial combined the western, musical, and science fiction genres. The first episode is 30 minutes, the rest about 20 minutes. The serial film is about a singing cowboy who stumbles upon an ancient subterranean civilization living beneath his own ranch that becomes corrupted by unscrupulous greedy speculators from the surface. In 1940, a 70-minute feature film edited from the serial was released under the titles Radio Ranch or Men with Steel Faces. This was Gene Autry’s first starring role, playing himself as a singing cowboy.